New Ford Fiesta ST is Simply Terrific. The old Ford Fiesta ST was, without doubt, one of the best hot supermini’s ever, so Ford had to get the new model one hunder per-cent right in order to capitalise on the success of its predecessor. 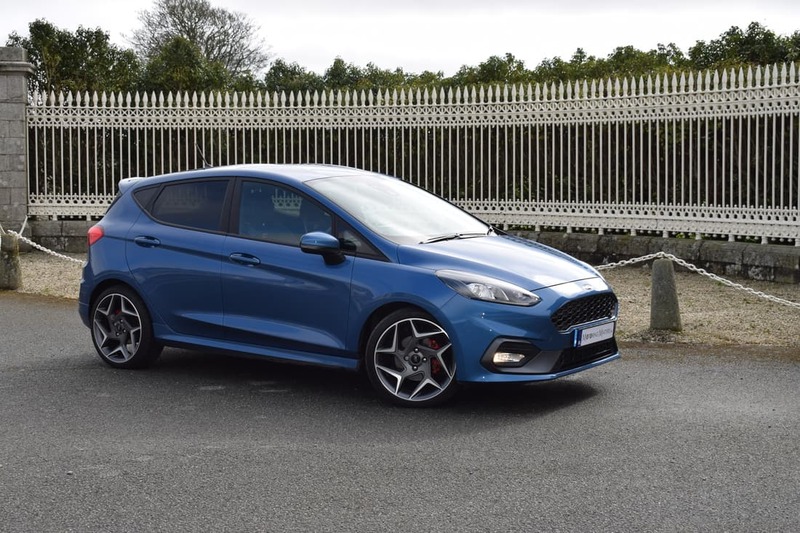 Thankfully, the all-new Fiesta ST ticks all the right boxes in terms of style, sporty prowess, desirability, performance, agility, and outright value for money. With the new Fiesta ST, Ford has replaced the old car’s 1.6-litre, 4-cylinder petrol engine with a new 1.5-litre EcoBoost, 3 cylinder petrol unit. The Fiesta’s downsized engine means that it boasts some impressive fuel economy figures, and it will definitely be cheaper to run than its predecessor. The all-new Fiesta ST is available with 3 selectable driving modes – Normal, Sport, and Track. Each setting fine tunes the cars performance by modifying engine mapping, throttle positioning, brake pedal and steering response. 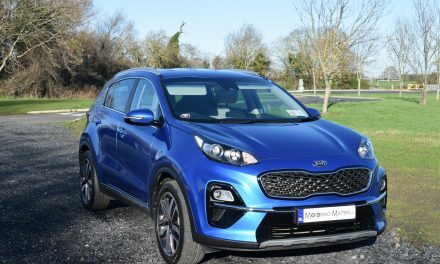 With a combination of Enhanced Torque Vectoring, Electronic Stability Control, and a performance tuned chassis, optimum handling is guaranteed, whether you are driving on the motorway, or enjoying a day on the race track. With Electronic Sound Enhancement (ESE) and an Active Valve Exhaust (AVE) system, the ST experience can be enjoyed thoroughly. AVE is a new technology designed to create a deeper rumble and roar based on the amount of throttle applied. ESE ensures that the evocative engine soundtrack can be heard from behind the steering wheel. 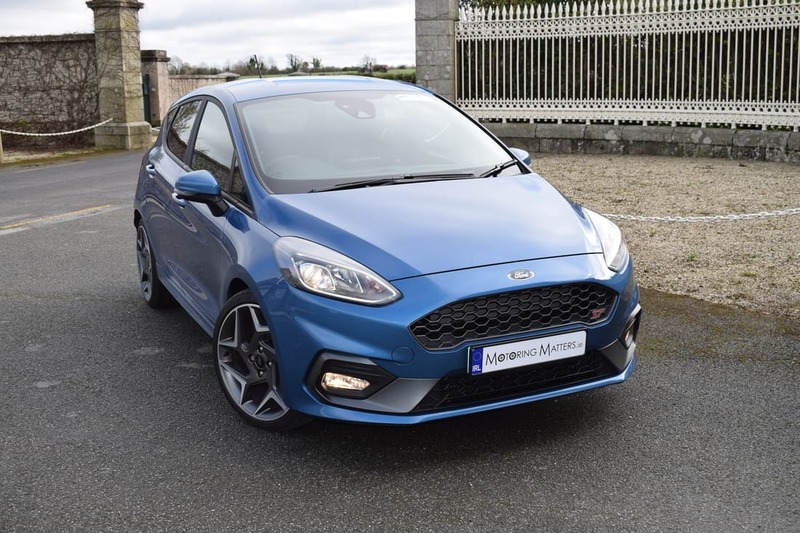 My test car was a new Ford Fiesta ST3 (200PS) 5-Door, 6-speed manual, and was finished in stunning Ford Performance Blue metallic paint for maximum visual impact. 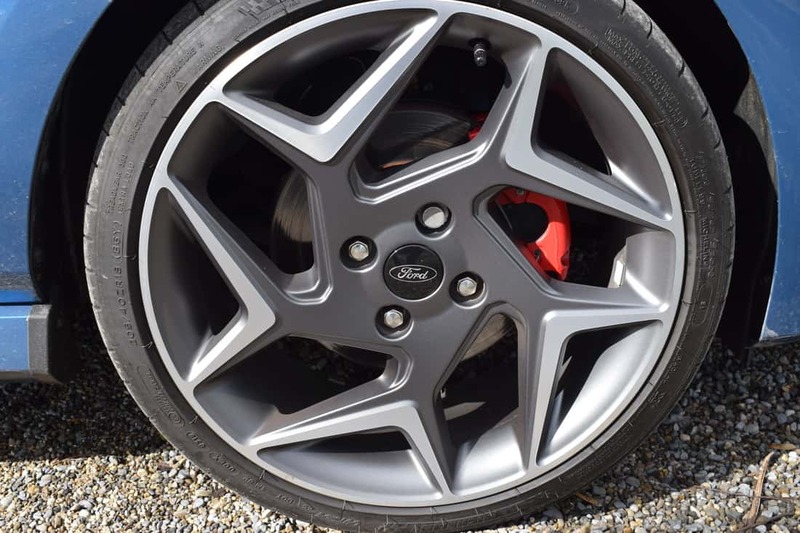 While the Fiesta ST2 specification is impressive, standard ST3 specification adds 18” magnetised machined alloy wheels, powerfold mirrors, large rear spoiler, partial leather Recaro™ Performance Seats, satellite navigation, keyless entry, rear view camera, rear parking sensors, auto highbeam assist, driver alert, road sign recognition, auto wipers, auto dimming rear view mirror, and a leather steering wheel with red stitching. Options fitted to my test car included a Performance Pack (LSD, Launch Control, and Performance Shift Lights), and a ‘B&O Play’ in-car audio premium sound system with Ford SYNC3 Navigation. 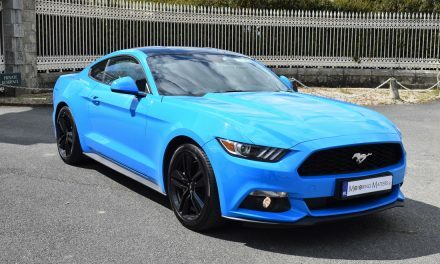 With a power rating of 200PS (197bhp), and a hugely impressive 290Nm of torque available, the 1.5-litre EcoBoost engine is capable of a 0-100km/h sprint in just 6.5-seconds, leading to a top speed of 230km/h (where permitted). A cylinder deactivation system is present on the new Fiesta ST, which means that the engine will actually shut down into two-cylinder mode when called upon to do so. While that might sound a little off-putting if your primary concern is driving fun and instant response from the engine, you’ll be pleased to hear that the deactivation and reactivation of the third cylinder is seamless and undetectable from behind the wheel. The major up-side of this system is that the Fiesta ST is capable of returning fuel economy of up to 47.1mpg (5.99l/100km) on an extra-urban driving cycle. 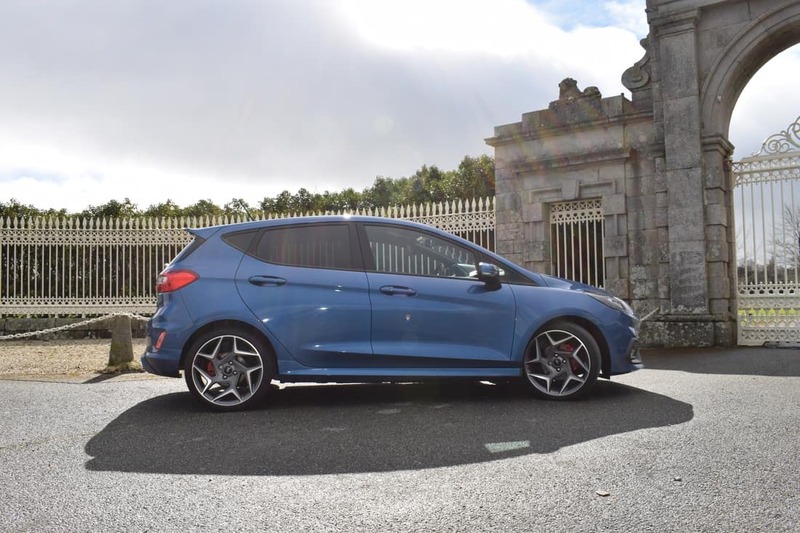 On the road, the new Fiesta ST provides driving thrills in abundance, with sharp steering, terrific grip, excellent driving dynamics, and supportive sports seats adding to the fun. The Fiesta ST is astonishingly quick and responsive on a twisty country road, while still retaining the usability that makes the regular car so popular. This really is a car that can be used every day, for every occasion, and is guaranteed to raise a smile on every journey. Handling was always a strong point with the old Fiesta ST, and it remains so with the latest model. 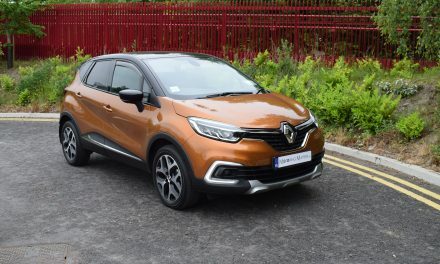 It is one of the most entertaining hatchbacks on sale, and its supermini proportions make it an easy car to maneuver in and out of a tight spot. My test car’s standard rear parking sensors and rear view camera really helped in this regard too. 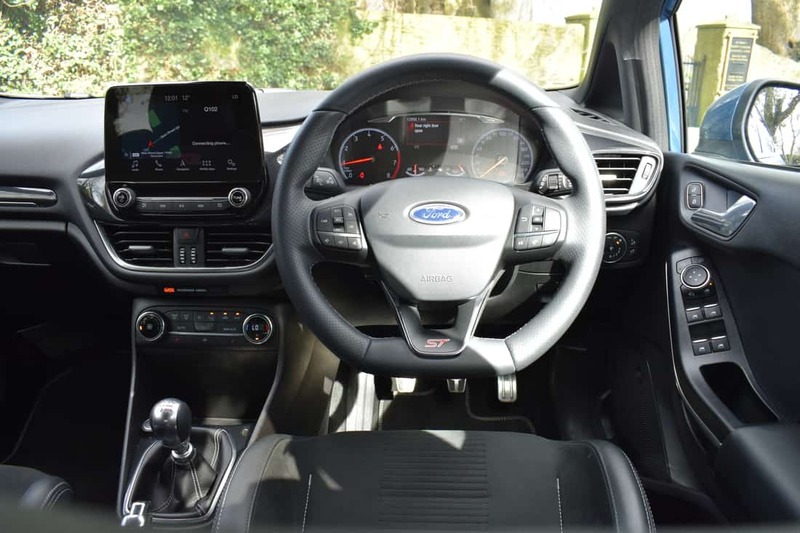 The cabin of the new Fiesta ST is a pleasant place to be, with well placed controls, terrific build quality throughout, and good levels of interior space for this class of car. 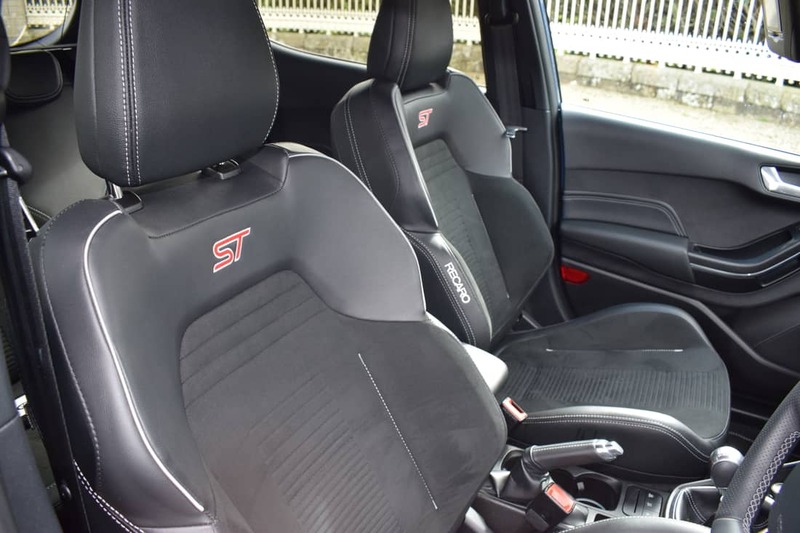 The Fiesta ST driver and front passenger benefit from supportive & figure-hugging Recaro™ sports seats with excellent adjustment for the driver, while the steering wheel has an ample range of telescopic and height adjustment too. 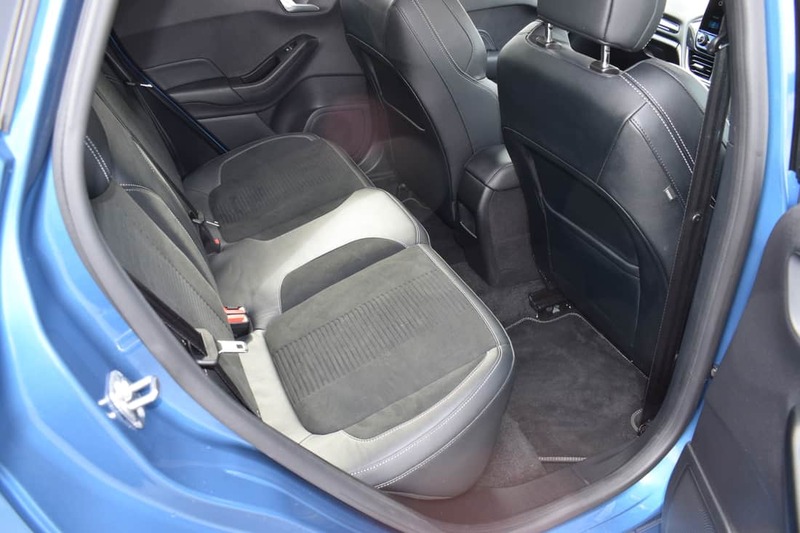 Thanks to pedals that are perfectly aligned with the drivers seat and steering wheel, getting comfortable behind the wheel of the new Fiesta ST is a simple task. Additionally, the ST stands out from the rest of the Fiesta range thanks to carbon-effect trim inserts and plenty of ST badges. 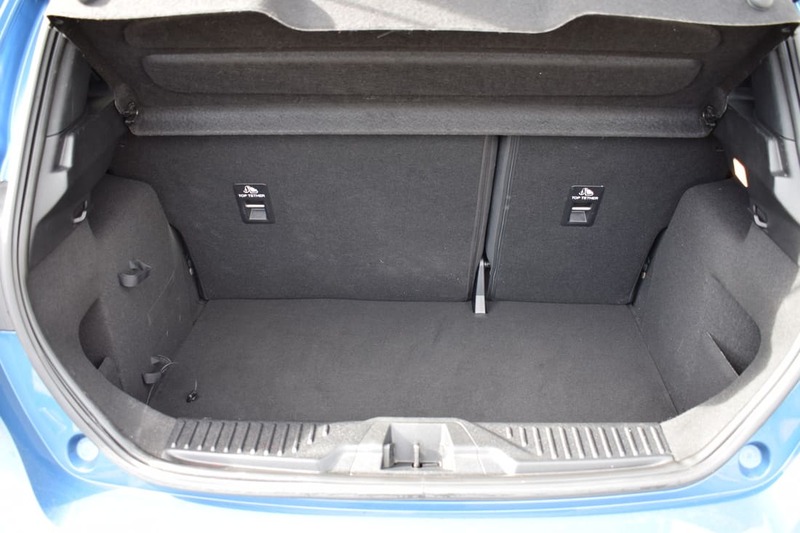 Boot space, with the rear seats in place, is a respectible 311-litres, but does rise dramatically once the rear seats are folded for added practicality. The new Fiesta ST’s sporty design shares much in common with the popular ST-Line version of the regular car. There is a honeycomb grille at the front with unmistakable red ST badging, but aside from that the only noticeable changes are black inserts on the sporty front bumper, the ST’s unique alloy wheel design, a lower stance, a subtly different rear bumper and a twin exit exhaust setup. 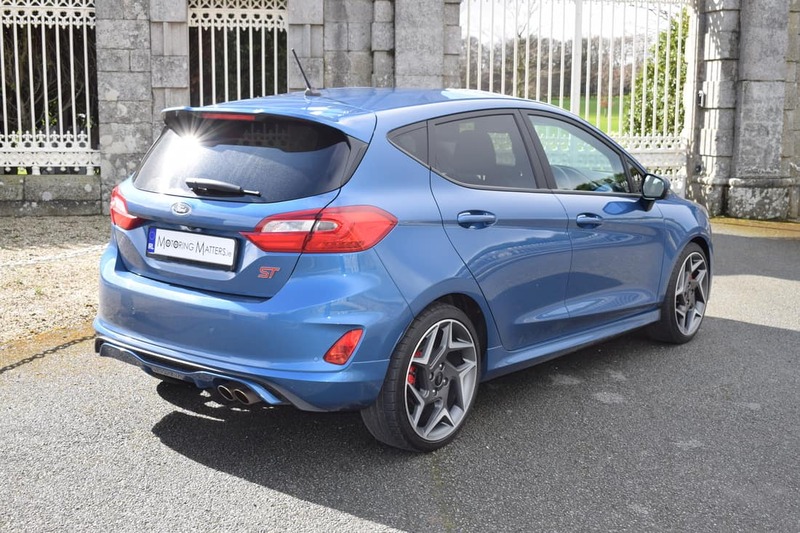 Prices for the new Ford Fiesta ST start at just €25,277 (ex-works), while the optional extras on my ‘ST3’ test car brought the overall price to €29,100, which genuinely does represent terrific value for money. There has always been something uniquely special about a fast Ford, and the wonderful new Fiesta ST brings that special feeling to a whole new level. 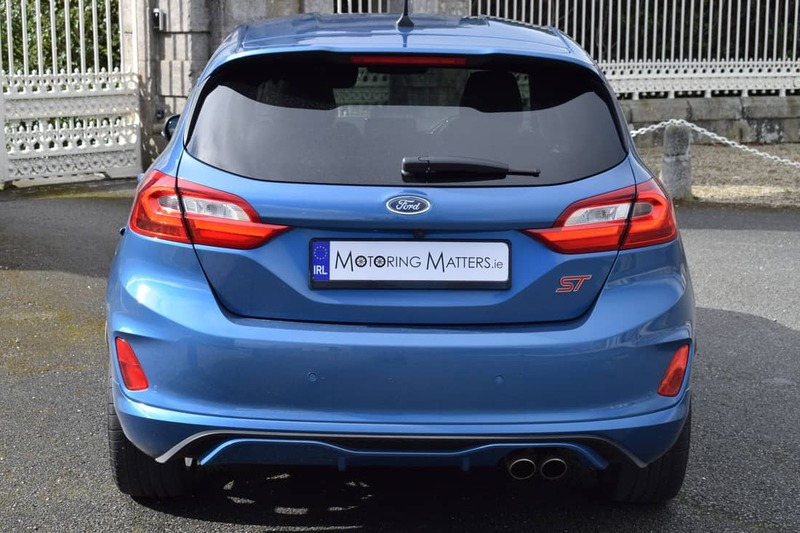 Visit www.ford.ie for further information. 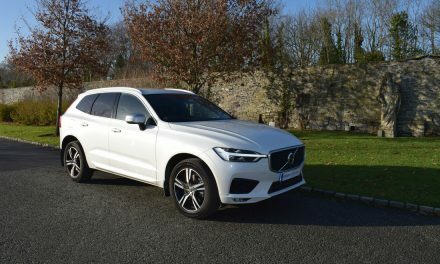 PreviousGeneva Motor Show 2019 – Full Review of all the stars of the show. NextNew Audi SQ5 TDI – Pricing Announced.